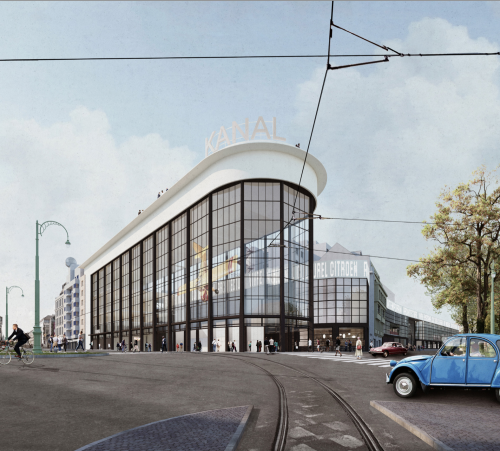 The architectural project of the offices noAarchitecten (Brussels), EM2N (Zurich) and Sergison Bates architects (London) has been unanimously selected for the conversion of the former Citroën Yser garage into a new cultural hub which, under the name KANAL – Centre Pompidou, will bring together a Museum of Modern and Contemporary Art, an architecture centre (CIVA Foundation) and public spaces devoted to culture, education and leisure. The jury of the international architecture competition praised a project that is ‘exceptionally well integrated in its context’. 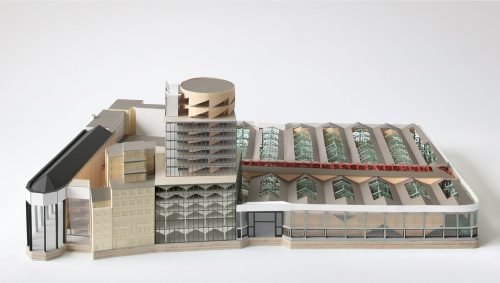 Entitled ‘A Stage for Brussels’, the winning project highlights all the iconic elements of the existing architecture. 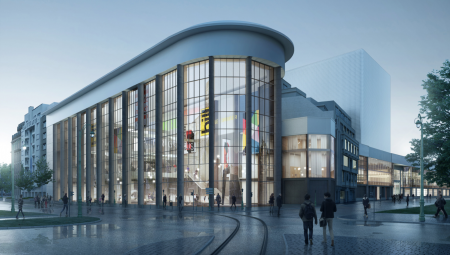 The emptied and restructured showroom will become KANAL – Centre Pompidou’s ‘display window’, home to installations, performances and concerts on the ground floor, and a restaurant on the third floor. The large white outdoor frieze will be extended so as to encircle the whole building in the form of an electronic display sign that can be used to communicate information or that can be integrated in an artistic project. 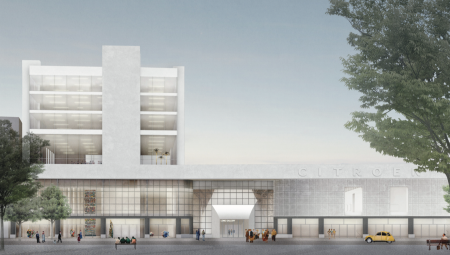 Inside, a transverse ‘street’ will cross the site measuring 35,000 m2, giving access to three large ‘boxes in the box’, which will be inserted in the former workshops and will accommodate the Museum of Modern and Contemporary Art, the CIVA Foundation and a 400-seat auditorium. 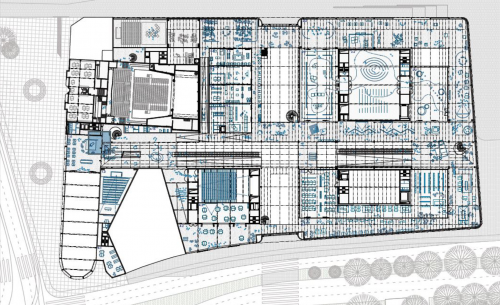 This solution will enable the team of international architects to control the climatic conditions of the different spaces, but it also reflects the team’s desire to breathe life into all of the building’s façades. The museum will benefit from exhibition spaces spread out over four floors of varying heights, making a range of configurations possible. 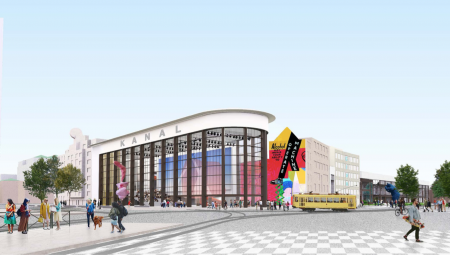 Work will begin in the autumn of 2019 and will be phased over several stages until the official opening in late 2022, enabling KANAL – Centre Pompidou to organize temporal cultural activities throughout the duration of the work. 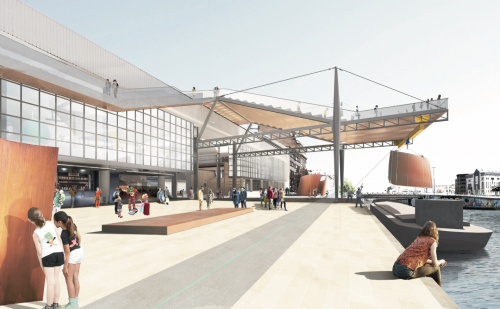 The winning team has conceived the cultural hub as a ‘welcoming, lively and dynamic place of exchange, a place that invites all Brussels residents to feel at home there’. 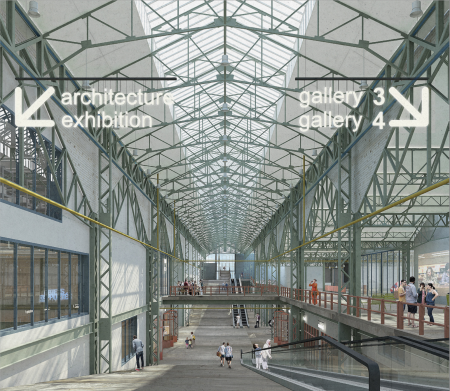 The project stood out also through its collaborative approach: the architects engaged in wide-ranging concertation with the sociocultural scene, whether locally (among others, JES, Maison des cultures et de la cohésion sociale, several Brussels artists) or internationally (Tate Modern, Deutsches Architekturmuseum). 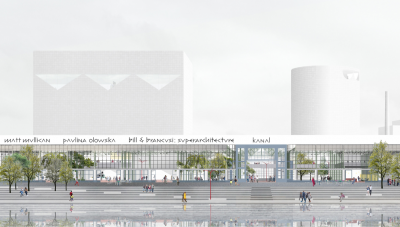 The project also includes an extension of the Kaaitheater and a functional connection with neighbouring institutions. 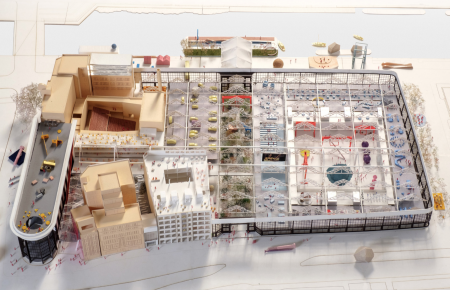 01/08/2017 (Docomomo Be) Competition Conversion Citroën Cultural Centre: Docomomo well represented!